There is a dramatic sense of spiritual freedom to the Lotus Flower King Pigeon Pose Pendant. The pendant features a yoga practitioner in the king pigeon pose whilst seated on an unfolded lotus flower. 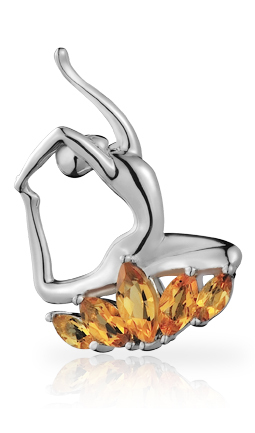 The Lotus Flower King Pigeon Pose Pendant is 925 silver with citrine stones clustered to represent a lotus flower.